Flex-Change 6 inch letters are printed on a 6 7/8" high flat .030 mil thick UV protected plastic panel. This is the most popular 6 inch flexible plastic letter used with Portable Signs, Flashing Arrow Signs, Changeable letter Sam's Club signs and custom signs. 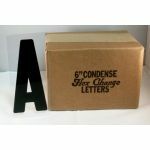 Often referred to as a 7" letter by many of our customers. The 6 7/8" panel is mis-measured or rounded of and called a 7 inch letter, the panels true measurement is 6 7/8". 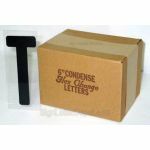 These letters will fit and can be used to replace letters for signs using the 030 mil 6" on 7 inch flexible plastic letters. Copy-Change letters are to be used with sign that use "Texas Track" or 030 flex letter track. See our "Sign Letter Track" to match the sign letters with the track you sign uses. Note: These letters are not recomended signs with letters behind enclosure doors, vandal or window covers or extending letter changing poles.